Originally published in "It's About Times," the Abalone Alliance newspaper, November-December 1984, and titled "San Francisco Bids for Battleship Task Force". 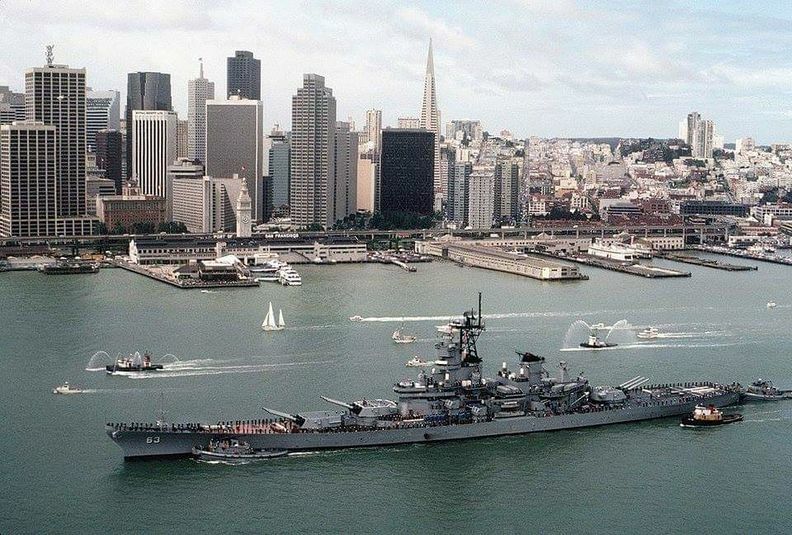 USS Missouri steams into San Francisco, mid-1980s. On September 15, 1984, Mayor Dianne Feinstein formally asked the Navy to make San Francisco the home port of the USS Missouri and its arsenal of cruise missiles. The Missouri, also known as “Big Mo,” is a World War II battleship that weighs in at 57 tons. It is 18 stories high, 900 feet long, and over 100 feet wide. 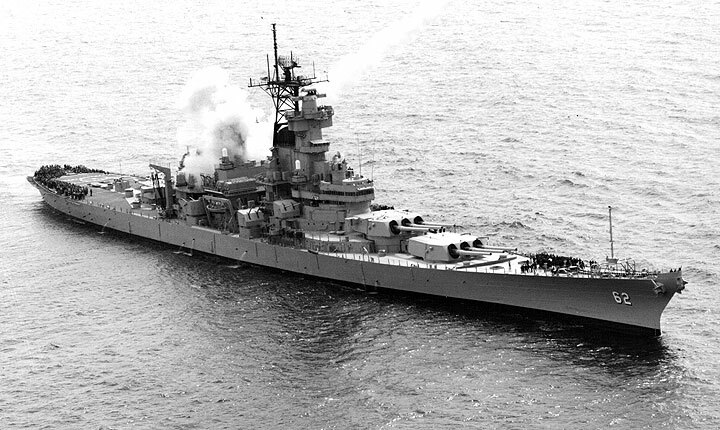 Along with three other battleships of its class, the USS New Jersey, Iowa, and Wisconsin, the Missouri is being pulled out of mothballs and refitted with 32 Tomahawk cruise missiles, with both nuclear and conventional warheads. The USS New Jersey, a battleship very similar to the USS Missouri. "No Big Mo" demonstration on waterfront, San Francisco. Mayor Feinstein’s vigorous push to bring the Missouri and its supports ships to San Francisco is supported by almost every politician, including those who support a nuclear freeze. The seduction of a $60-million military payroll has turned even the most progressive politicians into opportunistic mush. Even Congressman Ron Dellums, who helped lead the fight both against the battleship program and the cruise missile, has now signed his support to the Mayor’s proposal. According to Lee Halterman, Dellums’s head staffer, “since the battle was lost to stop those programs, it’s now Dellums responsibility to bring in as much of the economic benefits from it as he can to the 8th District.” In other words, if you can’t beat ‘em, join ‘em! Halterman did indicate that in light of the opposition and safety issues beginning to emerge, Dellums will be re-examining his position. Peace Navy obstructs USS Missouri during contentious campaign to homeport the Missouri in San Francisco during the 1980s. Saul Bloom describes his own history with Greenpeace and opposing the homeporting of the USS Missouri in San Francisco during the 1980s. Video: Chris Carlsson and David Martinez, from the Ecology Emerges project. Congresswoman Sala Burton has voiced conditional opposition to the Missouri because of her concern about the possibility of its cruise warheads accidentally detonating in the Bay. Though this is unlikely, a ship collision could set off the conventional explosive used to initiate the chain reaction in the cruises’ nuclear warheads, sending up a cloud of nuclear debris. As far as local politicians go, only Berkeley Mayor Gus Newport has unconditionally opposed the homeporting. Grassroots opposition, however, is beginning to emerge as local antinuclear and anti-interventionists activists examine the issue. They made their presence felt during the fourth annual Fleet Week celebration, sponsored by Mayor Feinstein in conjunction with private business groups. On Saturday, October 13, 1984, eighteen Navy ships cruised into the San Francisco Bay. The Peace Navy, a local group of aquatic activists, sailed 25 boats strong past the mayor’s reviewing stand, protest banners flying. They then floated between the Navy ships and the crowds of spectators on shore. Meanwhile a group of people leafleted the largely pro-military crowd as the Blue Angels air team screeched overhead. On Monday, activists arranged several incidents on board the ships docked for public open house. On the destroyer USS Callahan, a small group spilled blood all over a missile launching device, and moments later over the onboard helicopter. In the tension that ensued as Navy personnel closed off several areas to the public, another group began to sing irreverent anti-war songs aboard the USS Elliot, right next to the Callahan. Both groups were escorted off, as more sections of the ship were closed down. Later the singing protesters took a tour of the massive USS Constellation, where they performed on the flight deck to a large audience before being hustled off the ship. 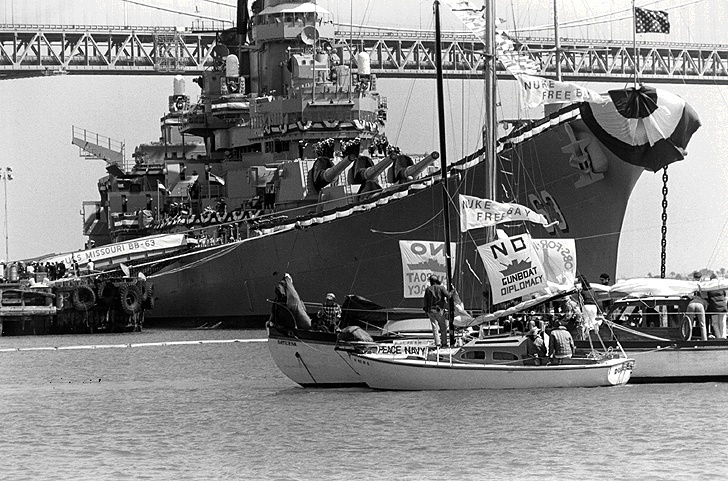 Protesters circle up during action against USS Missouri, 1984. The coup de grace came later that night at the Mayor’s bash for Navy brass and local socialites in City Hall. Protests by about 200 rowdy demonstrators raged outside. A mock battleship and flags were burned and nine people were arrested, as protestors did die-ins in the surrounding streets. Meanwhile, It’s About Times staffer Ward Young, decked out in his Sunday best, gained access to the gala affair. Just as the Mayor was beginning her remarks, Young jumped out in front of the ten-foot long, submarine-decorated cake that was to presented to the Navy. Plunging his hands repeatedly into the cake, he told the shocked crowd, “The people of Central America say they want freedom. I say, let them eat cake!” Seconds thereafter, police hauled him away. Inspector John Hennessey, spokesperson for the San Francisco Police Department, told reporters, “We know we got the right guy because he had frosting all over him.” After four hours in drunk tank, Young was charged with public drunkenness and released. To win local support for her proposal to homeport the Missouri in San Francisco at the old Hunter’s Point Shipyard, Feinstein is holding out the carrots of a $60-million military payroll, up to $30 million in ship repair contracts, 500 private security jobs, and lots of money spent by free-wheeling sailors. However, as facts slowly ooze to the surface these statistics begin to lose their luster. For example, a Navy study states that sailors spend only about 40% of their disposable income in their homeport region. Besides the expensive give-aways Feinstein is offering to lure the Navy, the day-to-day cost in city services to the base and its dependents must be taken into account. As for job creation, there would certainly be a rash of short-term construction jobs, but the actual number of permanent jobs is questionable. The Hunter’s Point neighborhood is being told that unemployed residents there will get most of the new jobs, but if San Francisco’s India Basin Development is any indication, most of the jobs will go to skilled workers from other areas. Finally, there is the question of housing. The Missouri deal is providing the Mayor the opportunity to finally make good her promises of new low-income housing. However, it will be on base and for Navy families only. She has also secured promises from realtor groups in the Bay Area to give the Navy “first notification” of appropriate available housing. The likely scenario is that property values will increase around the Hunters Point area, making homeless many of the poor residents who have been promised benefits from the base. With all the billions being poured into high-tech weapons, one may wonder why the Reagan administration is eagerly pushing the revival of WWII rust buckets? A quick jog down military memory lane will recall that it was with the battleship that the English established “Pax Britannica” for over a century. Battleships, by definition the largest ships with the biggest guns and the heaviest armor plating, continued to evolve with ever larger mass and firepower through WWI. In between the World Wars, General Billy Mitchell stubbornly argued that the airplane would become the most important weapon in the next war and should be given top priority for development. He was right to a degree. Many WWI vintage battleships were lost to advanced torpedoes from both airplanes and submarines at the beginning of WWII, and the Battle of Midway in 1942 proved that airplanes from aircraft carriers could extend the battlefield inland beyond the range of the battleships. However, in the latter years of the war, the Iowa class battleships, to which the Missouri belongs, were built with two extremely thick hulls. The double hull made them nearly impossible to sink, for even if a torpedo pierced one, it had the other to contend with. In addition, Iowa class battleships had 16-inch diameter guns mounted on their decks, still the largest naval guns in the world. Several of these battleships were involved in the Korean War in the early 1950s, but all were put into mothballs for storage after that, and preference was given to developing new aircraft carriers and submarines. The New Jersey was revived for a few years in the late 1960s to pock-mark the coastal areas of Vietnam with over 5,000 rounds from its 16-inch guns. One shell from these guns is packed with over 2,300 pounds of TNT and can be shot up to 23 miles. If the Missouri fired a round from the Golden Gate Bridge, the shell would explode just short of Concord, blowing a hole 40’ by 40’ by 10’ deep. The latest revival of the battleships began around 1978, when Charles Myer Jr. left the Pentagon to work as a private consultant to several major weapons producers as a specialist in “tactical weapons conceptual development.” Myer saw a growing need for a more effective means of “forcible entry” when the US wanted to “insert” troops into Third World nations that stray from the American Way. The problem, as Myer saw it, was that weather restrictions made aircraft unreliable for blowing away a safe path for landing assault troops. The solution that Myer proposed was to modernize selected WWII battleships and outfit them with advanced cruise and Harpoon missiles. Unlike a more vulnerable carrier, a battleship with super armor can “cruise into harm’s way” right next to the shores of an errant Third World country. When the visible threat of terror is not enough, a battleship’s guns can deliver it, day or night, rain or shine. With conventional warheads on 1500-mile range cruise or medium-range Harpoon missiles, the battleship doubles as an accurate bomber, minus the need for pilots and jets. If invasion troops are required, they can disembark from the battleship as its guns roll out a landing patch, and re-embark as the carpet is rolled up behind them. With nuclear warheads on cruise missiles, a battleship is the ultimate threat to non-nuclear nations. It also becomes part of a nuclear war-fighting strategy against the Soviets, both as an element of a first strike and in the insane concept of a protracted nuclear war. With the modernized battleship, the “deadly connections” become transparent; nuclear weapons frolic with conventional options and East-West tensions embrace those of North-South. The Carter administration opposed the battleship program when funding for it was first proposed to Congress in spring of 1980. A determined Myer found a more receptive ear in John Lehman, who after the 1980 election became Secretary of the Navy. Lehman, along with National Security Advisor Richard Allen, was easily able to sell a pro-Navy Reagan on the plan. Reagan is committed to creating a 600-plus ship, 15-carrier Navy. Its funding is already approved, and the new Navy is scheduled to be reality by 1989. The battleship modernization plan offered much faster delivery dates and overall economy than building comparable new ships to carry the cruise. Not coincidentally, new nuclear weapons are the only programs that have received the same priority as the Navy build-up, demonstrating how intertwined the two programs are. The New Jersey and Iowa are already recommissioned and out at sea. It was the New Jersey that shelled Druze militia positions from off the Lebanese coast in 1983, and the Iowa has recently been lurking in the Gulf of Fonseca off Nicaragua. 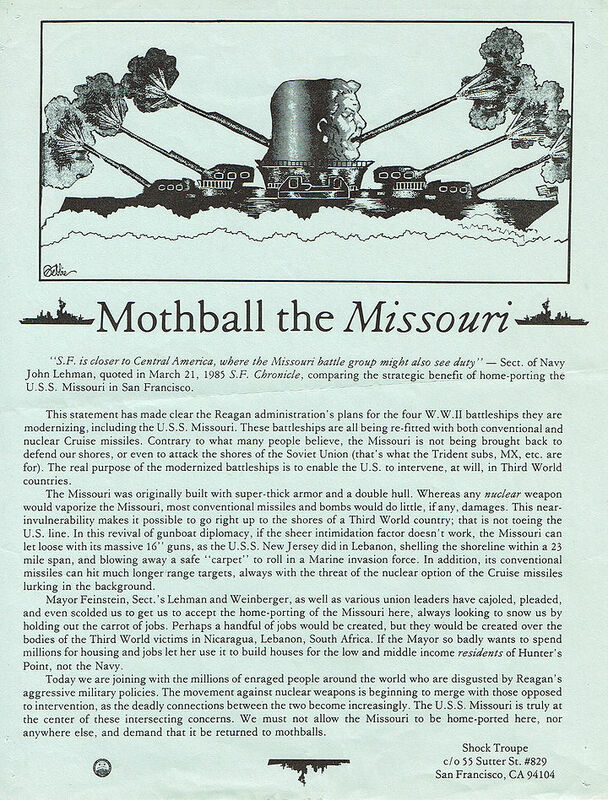 This flyer was distributed in San Francisco during the campaign against the homeporting of the USS Missouri, by an informal group that took the name "Shock Troupe.